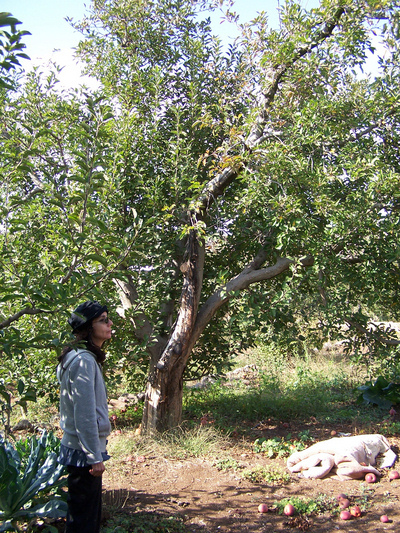 While in Israel I was hosted at the orchards and Nursery of Ben-Dor Fruits in the Hula Valley. Joseph “Seffi” Ben-dor is a second-generation nurseryman there. His parents were pioneer farmers there and both died of malaria, a common fate from the swampland the valley used to be before it was drained. Seffi is a force of nature, and tirelessly farms and develops new varieties in the pioneering spirit of the valley. Of particular interest is a line of colored apricots called “Color-Cots” that have a burgundy red interior and an orange skin. He took a big chunk out of his busy day to graciously host us and give us a whirlwind tour of his orchards and greenhouses. What he is holding above are an apple rootstock that was developed especially for hot climates. Prof. Rafael Assaf developed these at the Volcani Institute in Israel by crossing the local hashabi seedling rootstocks with dwarfing Malling rootstocks. Three sizes have become standardized, and I am in the process of importing them into the USA, a three-year process. 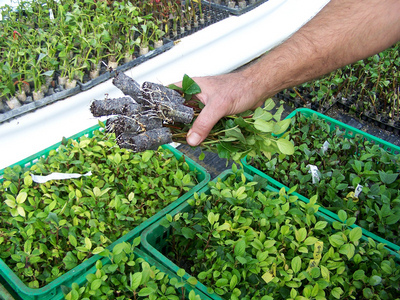 Seffi propagates them via cuttings, growing individual trees in soilless potting medium. His greenhouses are set up to be able to do this continually all year by controlling light, temperature, humidity, and watering. In return I’m to help them import Arkansas Black and Williams’ Pride, which should color up very well in any climate in Israel, from the Golan to the Negev. But don’t look for them any time soon, nor for the Hashabi rootstocks in the USA; things move quite slowly in the apple world. 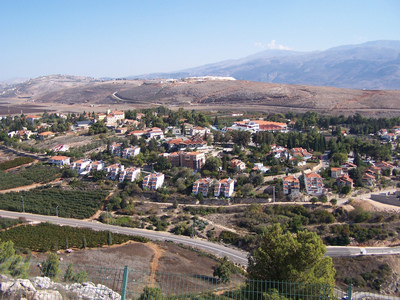 In the northern-most region of Israel is a tiny alpine town called Metulla, which is bordered on three sides by Lebanon. It becomes a trendy location by February with skiers hitting the slopes if Mt. Hermon, Israel’s only ski-lift. The town is also famous for the apple orchards which ring it. Indeed, they are the prettiest things you ever saw, and the town incorporates an apple onto all it’s civic logos and interpretive signs posted on notable structures in town. We stayed at the Alaska Inn, billed as “The Innest Hotel in the North”, which was quiet during the off-season. The tiny town also boasts a steak house that has an impressive array of BBQ and smoker equipment outside; they take their meat seriously. It also has the Canada Center, which combines an ice rink, bowling alley, waterslide/pool complex, gym, and pistol range. We followed dinner up with a night stroll down the stone-paved sidewalks and felt quite safe. This peaceful, friendly town seemed a world away from the war that sometimes washes over it. We spent the last two weeks in Israel and visited a couple apple-growing regions (yes, you probably didn’t know Israel grew apples). The above tree is in the Golan Heights in a Druse village and is one of the first apple trees planted there in 1946. The variety is Starking Red Delicious and it is considered old by their standards and middle-aged by ours. The northern portion of the Golan up against Mt. 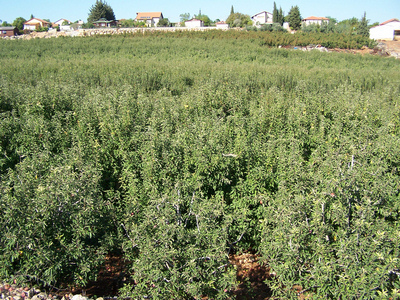 Hermon is quilted with apple orchards, mostly grown on local Hashabi rootstocks, trained as semi-dwarf spaced about 10 to 15 feet apart. The varieties growing in the area were Golden Delicioius, Starking Delicious (Red Delicious hybrid), Granny Smith, Smoothee (a Golden Delicious hybrid), Jonathan, and Gala. None of these would be much good flavor-wise in the store. However, a grower told us had just harvested their first Pink Lady apples, which he said were delicious and fetched an excellent price. Indeed, the sack of them he showed us looked really good; I think they will really catch on there.